This entry was posted on Tuesday, October 18th, 2011 at 19:31	and tagged with freewrite, ideas, inspiration, short stories, Short-story competitions, words, writer, writers, writing, writing exercise and posted in Uncategorized, Writing. You can follow any responses to this entry through the RSS 2.0 feed. hahaha, I like the concept- fitness via jottings. I have done Morning Pages for 14 years now, ever since reading The Artist’s Way. It’s like brushing my teeth, and gives me a nice warm-up. As for my regular writing, which is separate from Morning Pages, I prefer mid- to late morning, after I’ve done my physical exercise. Some days that doesn’t work in my schedule, and I move it to afternoon, which also works fine. As long as I get my work done before the 4:00 p.m. witching hour, when I turn to mush for a few hours, I’m good. I’m a dual writer I suppose. I enjoy writing late at night best but since I now have the dreaded 9-5 job, I have had to adjust to write during the early evening. I’m still able to reach my desired daily wordcount but I do miss my late night writing marathons. Yes,I know, it’s the ideal really as we often can’t afford to write during our ‘ideal’ time slot, can we… those pesky jobs keep getting in the way! Oh that it weren’t so… Thanks for the comment! This discussion about finding times of day conducive to writing led me straight away to thinking about the way varying times of day are related to varying states of consciousness, and so on to considering varying states of consciousness as a whole. Changes of consciousness intimately affect our thoughts and so our writing process. After all, how many writers have admitted that they deliberately employed drugs (and I include alcohol as a drug here, of course) to enhance/facilitate their creativity? Not ignoring that, if badly managed, there can of course be serious drawbacks to this type of approach, there is a whole range of intoxicants that at least temptations. Perhaps, as with fire, we are looking at something which can be a good servant as well as a bad master. I suspect few of those who read this are teetotallers and several us us probably like to compose with a glass of wine, or whatever, at hand. On the other hand, I know from experience that the creative tap sometimes starts to flow for no apparent reason, while sometimes discipline and routine are required to produce success.Then again, sometimes a little drop of what you fancy hits the creative spot, while sometimes the muse is just too pooped to party. As ever, I bow to her sovereignty and go with the flow. 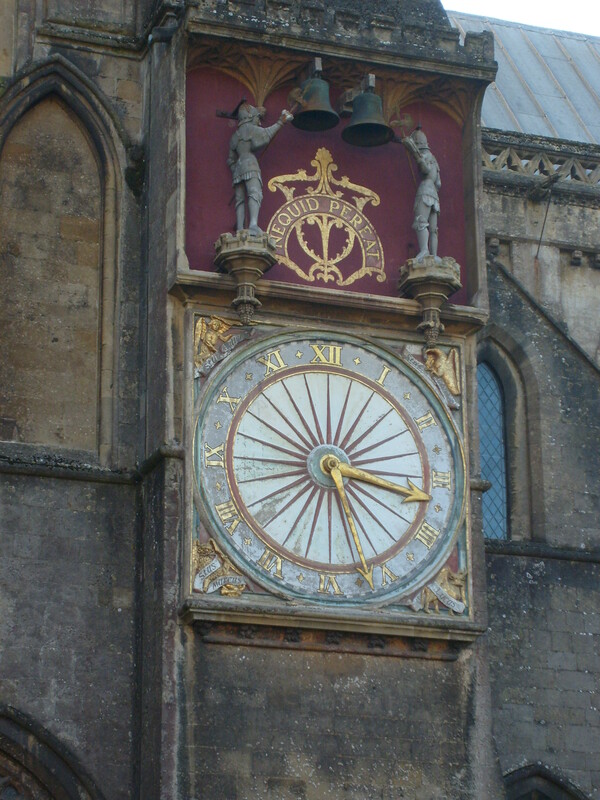 ALSO: seeing the clock from Wells brought back some happy memories . Thank you. I certainly wish that I’d had a notepad beside the bed recently. I’d enjoyed (if that’s quite the right term) a particularly vivid ‘horror’ dream, that when ‘analysed’ as I lay there after waking, seemed to hang together well enough for a story. I even told my wife about it. But by breakfast time it had all slipped away. How I cursed silently: Who knows, It might have been my Harry Potter moment – or at least a Buffy the Vampire Slayer moment. thanks for ‘following’ my blog, sue. i have spent a few nights in waterford and am pretty sure my family came from wexford. it is beautiful, waterford. anyway, i never really kept such a log except for a period in my life when i had kne reconstruction. the pain meds asured that i slept a lot and i noticed that the more i selpt, the more i seemed to fream, so i started writing all i could recollect of the dreams. some of them are pretty wild to look back at, when i see all the images i detailed…even down to the appearance of the three stooges in one of them! i am a night owl and i seem to get creative spurts at about 1-4am…more ideas and phrases for things to work on when i am less tired but sometimes i really brainstorm, like making lists of 15 or 20 blog topics for the future or articles i want to pitch. workwise, i seem to do best if i just get up, make coffee and commence to writing. the biggest thing for me is the first sentence. if i can stop the procrastination enough to jot down the first line, i often end up with a whole chapter at once, which has been lurking in my subconscious, waiting to come out…that’s how it feels, at least. It’s a small world, Michael. And the internet makes it so much smaller. I like how you use your time – if I’d had that pain, I probably would have wasted the time feeling sorry for myself. I guess you could say my writing time is like bookends: I always get my best writing done either in the morning, after I’ve woken up and settled in with some coffee, or at night, before I go to bed, when I wind down about an hour before turning out the light. My perfect writing day starts with writing and ends with it as well! It works out perfectly; work and other things get wedged in between, but the writing becomes the support for my entire day. That sounds like a sensible routine Ellis. Wish I was just as flexible, and disciplined. I write a lot when I am in a Taxi and when I have just returned from work,simply around the evening hours but I also jot down some notes whenever a thought knocks my mind. I have not found a particular time I call mine for writing.i just write,write,write and write! You are lucky you can write on the move. I need silence and stillness. I envy cafe writers.